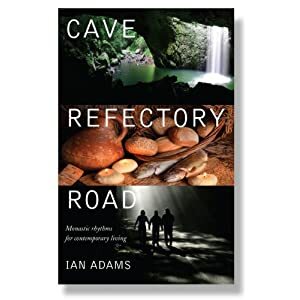 ian adams has a book out this week cave refectory road. i had a sneak preview of the manuscript and thought it was delightful. for those seeking to follow in the way of christ today, ian opens up the gifts and insights of religious communities in a very imaginative fashion. he's not a monk but he says he has peered over the wall and discovered many things that are really helpful and is trying to copy some steps and rhythms that help re-discover the christian faith as a source of goodness for the world.. he manages the difficult art of writing in a way that has real depth but is very accessible and easy to grasp. his choice of words feels carefully chosen to find language that is resonant and hopeful rather than relgious and predictable. as you can probably guess cave is about withdrawing to seek god alone in devotion, refectory is about shared living and hospitality around the table in community and the road is about engaging in the world. he explores and suggests practices, he writes poems and gently and humbly offers a picture of the life of faith that is earthed, hopeful and human. it's not hyped. it's not riding on the new monastic interest for the sake of it. it is genuine, authentic - just as ian is. he embodies the things he is talking about which is no doubt why it has depth. i want to read it again and use it as a book to talk with other people about spirituality - maybe in grace, or cms or wherever. inspired by ian's themes we did part of the last grace around cave refectory road and it seemed to catch peoples imaginations. the ideas are written up here. harry did a station based on cave that was wonderful - the images from it are linked to. i'm making that worship trick 95 in series 3. i just noticed the road psalm was the last worship trick - we should have used that in the service - doh!